We have to use Mobile Patrol here. It has the booking photos and names usually. Sometimes the pictures don't make it on there though. We've got about 500 people booked so far this morning. The only stripper name would be Destiny who was charged with criminal trespass and burglary. I can't wait to see someone up on burglarsonarceny. There is a new pet store in town called "The Twilight Bark". For weeks I've been trying to figure out what play on words this was. It finally dawned on me, it's from 101 Dalmatians. It was the dog gossip line. untraceable too - what should I do with this freedom?!!! When we were at Busch Gardens a couple weeks ago, my daughter and I were getting on to a ride as a friend from her school (and her mom) who live right around the corner from us were getting out of the same seats we were climbing into. It was nice that they saw each other down there as it gave them a chance to go on a few rides and have a snack together. I just like that we were 1,200 miles from home and randomly ran into a neighbor! Saturday evening my daughter was getting picked up by another friend to go ice skating and when the mom and friend were standing in the driveway chatting with my wife before driving away, our neighbor from across the street came over to say hello because he was outside with his daughter and recognized the mom - she and him are doctors at the same medical practice! I always enjoy these little instances that show what a small world it is that we live in! Start cyber stalking old boyfriends! Ah yes, spy attire. We all know it when we see it. Oh, and because it's Wednesday morning, it's time to learn once again about our rightful place in the universe. This is a cool video by the way and worth watching in its entirety. There's a reason old boyfriends are old boyfriends! "You just mad because I tell it how it is and you tell it how it might be"
Buffalo live in Asia and Africa. Bison live in North and South America and Europe. So the song "Home on the Range" is wrong because buffalo have never lived in the American west. This morning as I was putting on my shoes to go for a run I thought, "It is probably time to get new running shoes but iIm not sure I should." Fast forward to me driving home from said run when I bumped a bird with my windshield. After it bounced over my roof and landed with a thud in the road, I stopped and went back to help it. I scooped up the poor little Tufted Titmouse who wasn't quite dead yet and moved him from the middle of the road. I decided to put him in the thicket by the roadside. As I maneuvered to the thicket I felt a SQUISH and looked down as my shoe and foot were submerged in mud. Guess I need to get a new pair of shoes. And that, kids, is how a Tufted Titmouse got me a new pair of running shoes. Fine. Since terraplnr isn't posting this it looks like it falls to me to do so. I should verify this before spreading rumors, but my 5th grader told me that the reason sharks don't like to eat people is because they don't like the iron in our blood. They take one bite and spit us out. They like the copper in seal blood instead. It seems potentially true but also a little fishy and likely something the kids were told so they'd feel safe snorkeling. Their mamas heeded Waylon and Willie's words. . .
FWIW, some Native cultures refers to them in English as buffalo. Do you know why sharks don't eat clowns? So a guy is stuck in a traffic jam and he sees a bunch of animals running around and police chasing after them. As he's passing a cop he asks what's going on. The cop says there was a big train derailment and a car carrying animals got sprung open. The guy asks if there's anything he can do to help. The cop says it would be helpful if he could take a group of penguins to the city zoo for him. The guy says no problem and loads the penguins into the back seat of his car. A week later the cop happens to see this same guy driving around with penguins still in the back seat. The cop pulls him over and says "I told you to take those penguins to the zoo last week!" the guy responds "I did. Now we're going to a ball game." Do you know why sharks don't eat lawyers? Huh, that's weird. Where did they get the word from? Like did they call it buffalo before everyone else called it a bison? What kind of shark is always gambling? A card shark! Please turn in your Dad Joke card. I recognized that instantly. Then again, I didn't just watch the movie, I read the book when I was a kid. Probably a bit better retention that way. How can you tell the ocean is friendly? It waves! How do undertakers speak? Gravely. I love my Stihl weed eater but sometimes I struggle to get it started. It likes to flood a lot. I thought maybe it was just me, but we have trouble with the backpack leaf blower on one of the fire trucks too. We tried to start it last night after a wreck to clean up, but the thing wouldn't start. It didn't start Saturday morning either. We started it right after in the garage though. I think it's just user error. I'm going by in a few minutes to figure it out. I was on my high school's It's Academic team, and we made it to the finals. 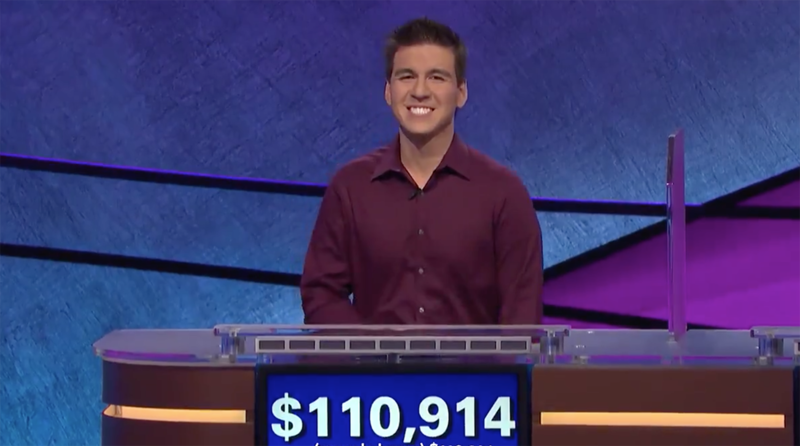 I used to think that I could do well on Jeopardy. Not anymore, thanks to James Holzhauer. I love sitting on my porch during thunderstorms. As long as I keep power, I just love thunderstorms. Turns out the carburetor needs a rebuild. Stihls are like the Apple of yard appliances. They look fantastic and work well, but they are entirely based on design rather than function. Getting to the carb took us like 20 minutes to get everything off. Last day of work here and I am going to miss my coworkers but will still see them on occasion. My unaided eyesight isn't very good. An unexpected to perk is the ability to experience a thunderstorm with the rest of my senses, except taste. I used to love sitting in a screened in porch and take off my glasses. My other senses would sharpen. The other sense would pick up the feel, the smell and sound of the storm. It's like being in the center of the storm and not getting harmed. It is truly a great experience that normally sighted people miss. I used to have that problem with my echo chainsaw. At the advise of one of our garage mechanics, I switched to the engineered gas mix and I run it till I run out of gas when I know I am not going to use it again for a while. I haven't had any issues with the carburetor in years. Before that I was taking the carburetor apart to clean it every other time I used it; granted I would only use it 3 or 4 times a year. Slightly related, I recently discovered that certain vinyl cutters like cricut and silhouette can be used to cut gasket material. Getting gaskets for some older motors both small engine and vehicles is hard to do. My wife & daughter has talked about getting one in the past but they were on the fence. I may just have to surprise them with one. We use the pre-mix gas. Just easier to haul around that way. Problem is a lot of these items sit for extended periods of time without use, and they need to be ready to go at any time so they usually sit with fuel in them. We started up 3 of our generators and a fan last night and let them run for a half hour or so just to make sure they all work. That's a real downside to a volunteer department. Not a lot of folks have spare time to run this equipment and keep it up, so it doesn't work when you need it to. i was stoked to see Kumquats at Sprouts the other day i bought some. Disappointed that they were so freakin sour. When we were in Florida a couple of weeks ago, my in-law's neighbors had houseguests from Nunavut! When I was little, my grandma's neighbor had a kumquat tree. My sister and I always knew that was a funny name for a fruit but we didn't know why it was funny. Anyway... one day we decided to try some kumquats. They were awful. They are quite pretty on the tree though. I just approved a "Suchi" restaurant. It has a salsa bar. Not sure if I should try it or avoid it. At least it has a kids area. Just submitted my formal request to work from home one day a week. I love the bennies here! Literally ALL of those things sound bad. We had a kumquat tree in our yard when I was growing up. The best use of the kumquats were to throw them and try to hit each other. Fun times! Who else has Good Friday off as a holiday ? We are off. It's causing havoc because no one really seems to celebrate it as a holiday so it's really unexpected that we are closed. Not me. But that's OK - Fridays are pretty quiet around here. Most of the hourlies work from home that day, so there's very few of us in the office. No holiday for us but I may find an excuse to leave early. It's usually pretty empty here on Good Friday.